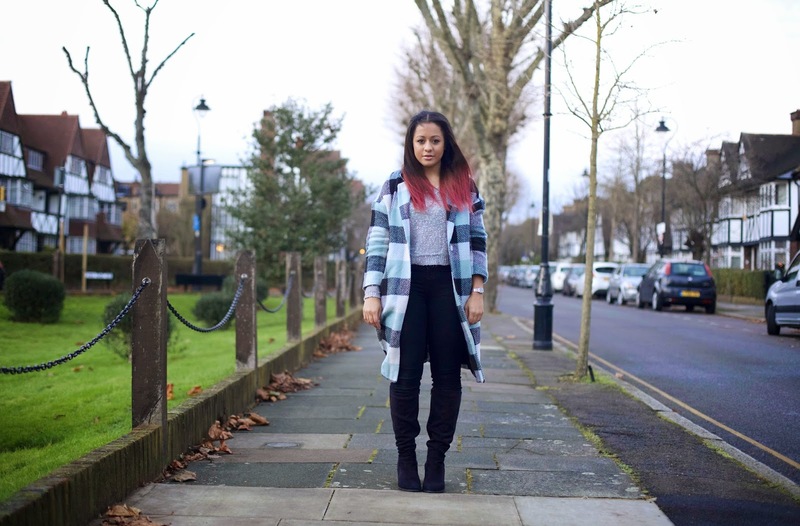 I thought I would brighten up the recent dull days with this checked coat from Fashion Union which is now on sale for a super affordable £20! I fell in love with this coat as soon as I saw it, the only thing which made me hesitate from choosing it was it looks quite 'spring' like with the bright blues featured in the coat. But then I had a second thought, the textures in the coat will keep me warm, plus spring is literally around the corner. I bought the coat in a size 12, and it fits me perfectly. Just for reference, usually, for these oversized coats from Topshop & Primark for example, I would definitely get a size down either a 10 or an 8. It's knee length on me and I am 5ft2", it has 3/4 length sleeves, and its definitely suitable for the recent weather we have been having in London. Sometimes Im a little wary about mashing colours together for example, my hair extensions are hot pink (watch a video here on how I dyed them) and id feel odd about buying a coat which isn't Black, Grey or some other basic colour. But I am extremely happy that I bought this cheerful coat, and finding outfits to work with it, is easier than I thought.